Blurb: Leoros doesn't have many friends. The son of a scientist and archeologist, he is constantly on the move. But when his parents make a startling discovery in Egypt, Leoros' world is turned upside down. Do you wish you could have the power of a god? Would you use it for good…or for evil? When an archeologist discovers the mythic Emerald Tablet buried beneath Egypt’s desert, her son decodes the ancient text leading him to a distant world. Leoros, who dreams of being like the heroes in the comic books, must fight to unlock the secrets of the universe to save a people he never knew existed. Atlantia, whose bloody visions wake her in the night, senses the darkness coming. Together they will face an enemy with the power of dark energy, lose a mentor to the assassin’s blade, and be betrayed by someone they trust. Their fight for the future is just beginning, and before it is over, a final sacrifice must be made. When the darkness comes, will they stand and fight or will they join it? There is darkness in everyone. 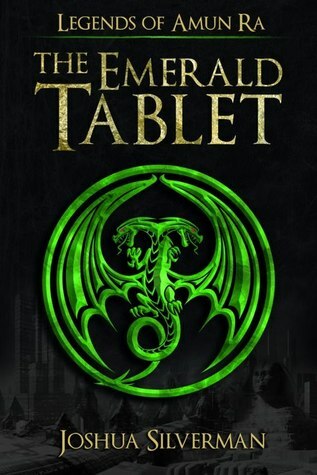 Review: ‘The Emerald Tablet’ is a mixture of the fantasy and sci-fi genre, but in all honesty it cannot be simply described by those two genres. It’s mixed in with mythology, history, archaeology and even a bit of romance. The entire novel itself is absolutely epic, and for a number of reasons. The main character, Leoros, sort of reminded me of Harry Potter in the first couple of books- innocent, a chosen one, confused etc. this being said, I didn’t find him to be too similar to Harry. They definitely had their differences, which while I adore Harry, was a really good thing to see and made him a lot more interesting to me. There were also moments I felt like I could really connect to what Leoros was feeling and some of things that were happening to him (so, okay I’ve never been transported to a different world but you know what I mean...) Of course, the supporting characters were also really interesting to me. There are a lot of supporting characters in this book, that I will admit, and some of them definitely interested me more than others- my favourites were probably Atlantia, Kesi and Dio. All of those characters are girls, and while they are all different- it was their strengths, both physically and mentally that made me love them so much- even though there were moments when I absolutely hated them. Another thing I really enjoyed was the development of each character, and even more so- the development of the relationships between the characters. The world was amazing, and I really enjoyed the actual world-building. I liked learning more things about the world and other characters at the same time that Leoros, and a few of the other characters, did. I also enjoyed seeing all the different characters from different parts of the world and how they all thought about certain things, how they reacted to those things and their history. I’m not really the biggest fan of battles/wars/lots of violence in books, or in general for that matter, but I still managed to find the battle scenes within the book interesting. For me, the way these scenes were described in a way that allowed me to visualise what was happening despite having very little knowledge about this sort of thing at all. This being said, there were moments that still slightly disturbed me and I found myself having to put the book down for a little while until I was able to pick it up again and move on (some of these pages my older brother read, he seemed to enjoy them a lot more than I did). The entire novel was pretty action-packed, but in those last one hundred pages on so things really started up. The build-up to the end was crazy, I couldn’t tear my eyes away from my screen as I read the last few chapters in one sitting that lasted about an hour. There were also little twists and turns, not just in those last chapters but the whole way through, that were so carefully constructed and were revealed at just the right moment. Obviously, I wouldn’t have been able to keep myself focused on this unless I enjoyed the writing- trust me when I say this book seemed massive to me when I was first starting it, despite having read longer books- this 408 page e-book seemed like some big monster that I’d never be able to get my way through, and though it took me a little bit longer than I would have liked (due to school commitments), when I did find time to read it, I read in quite big chunks just because I found myself unable to turn off my screen and leave this world behind. All this being said, there are moments in this book that made me feel a little bit squeamish or uncomfortable, so I wouldn’t suggest reading this book if you are under the age of about fifteen or so. Otherwise, I would definitely recommend ‘The Emerald Tablet’ to all of you, especially if you’re a fan of either the fantasy or sci-fi genre or if you’re just looking for something a little bit different. Thank you to Joshua Silverman for supplying us with a copy of ‘The Emerald Tablet’, therefore giving us the chance to experience this amazing book for ourselves. I absolutely cannot wait to read the next book in the series!